The IDS Vision Suite provides you a complete software support to put your vision camera in operation quickly and easily. Use the IDS GenTL Producer for your application or 3rd party software to have full access to your camera via the GenICam interface. The included IDS Vision Cockpit allows you to conveniently evaluate the camera functions. The IDS Vision Cockpit offers you a GUI to quickly and easily evaluate cameras without programming a line of code. In addition to the display of all camera parameters via the GenICam-typical node representations, the IDS Vision Cockpit offers many practical image information and dialog-based settings. Use the practical command line tools for example to automate the configuration of several cameras. Use ids_config to query and configure the network settings of the cameras. ids_devicecommand gives you information on all available camera settings via the GenICam interface. It also allows you to configure directly. 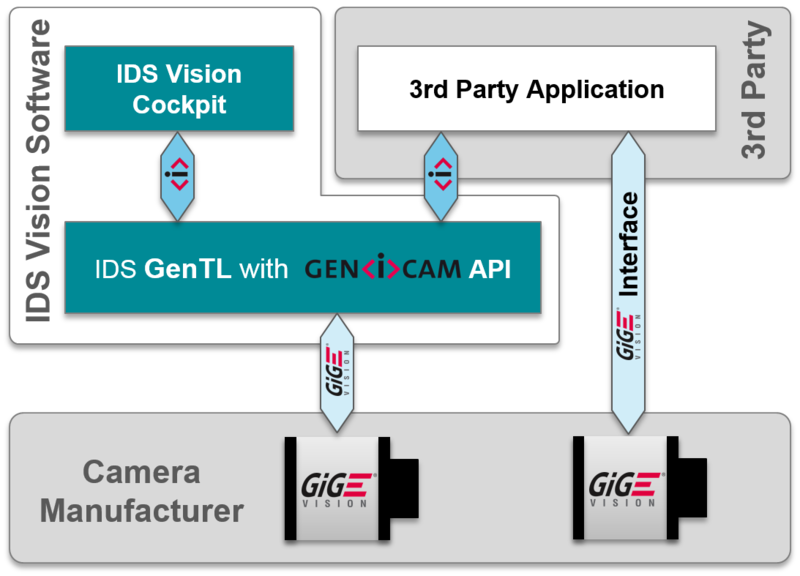 Install the IDS GenTL Producer for your application or 3rd party software that are based on the GenICam interface and have no own support for GigE Vision. The installation of the IDS GenTL Producer is recommended for using the IDS Vision Cockpit.